I pray that the powerful messages relayed during the weeks of Lent have strengthened our beliefs. Although repeated annually, these moving stories are never dull or boring and are sources for valuable reflection. I hope you have made an effort to spend quality time praying with your families, and also that time spent with your parish family was rewarded with a greater sense of peace and contentment. The Easter season is a time of hope: Mary went to see Jesus while it was still dark. That’s when we need to seek Him as well. When you think about it, things could not have been any more discouraging for the disciples. They had followed Jesus for more than three years, seen the miracles, heard His teaching – but now He had been tried and crucified. He was dead and had been buried in a tomb. All their hopes and dreams had been dashed. It was a very dark time. It would have been easy for Mary to just give up. It would have been easy for the disciples to deny everything they had lived for and turn their backs on Jesus. After all, they saw Him crucified on the cross! But they remembered the promise He had made to them! Many times, we are broken with sorrow, broken like Mary and Peter and John. We feel hopeless. We feel like an empty tomb become of some hurt received from someone. We feel like an empty tomb because of our despair about some difficult situation. We feel like an empty tomb because we have lost a loved one – but an empty tomb is not defeat. was the sign of His resurrection. from our tombs as well. on this beautiful Easter day. I wish you all a blessed Easter. “Happy Easter!” to each member of this wonderful parish, a caring family of faith. May the Risen Jesus be your light and hope and transform your life on earth. And may the Resurrection of our Lord comfort you in its promise of everlasting life reunited with our loved ones. Dear Parishioners and Friends of St. Clement! 2018 is behind us and 2019 lies ahead. I feel greatly honoured realizing the incredible privilege God has given me, the blessing it is to be Pastor of St. Clement parish family. I have not stopped thanking God for all of you and your great devotion and commitment in serving Him and proclaiming the Good News in this wonderful parish. It is my honour to write you and extend my sincerest thanks for your kindnesses and the support offered to the parish and to me over the past year, especially when I celebrated my 25th Anniversary of Ordination to the priesthood in May. As once was written "... no man is an island." This is truly the case with St. Clement parish family, since it takes all of you to make the parish function, grow and flourish. Looking back with gratitude, I can say with the most heartfelt joy and love that I could not be prouder of St. Clement Parish and that I am humbled to have the awesome opportunity to serve you. The Prayer Network, Cenacle of Prayer, Adorers of the Blessed Sacrament and all who support the parish by their prayers. Those who assist with the Lord’s Day liturgies: Our sacristans, Eucharistic ministers, lectors, altar servers and ushers. Those who help us raise our hearts to God as we worship: Our music ministers, three parish choirs and cantors. All who care for the Church inside and out, maintaining the building and grounds, and those who decorate the Church, especially our Christmas volunteers. Those involved in sacramental preparation: Our Prepare/Enrich and Baptismal Preparation couples; the First Sacraments and Confirmation teams; the correspondence catechists, and the R.C.I.A. team and sponsors. The children’s liturgists and those involved in the children’s Christmas pageant. The volunteers and parents who encourage our young people’s expression of faith through drama. The home/hospital Pastoral Care team, and those involved in the Ministry of Presence and in ministry to the bereaved. The Parish Advisory (Pastoral) Council and Finance Council; the Catholic Women’s League and Knights of Columbus; the Society of St. Vincent de Paul and their Christmas volunteers. Other quiet ministries within the parish: Our welcoming team, church librarians, rosary makers, office volunteers, collection counters and volunteer screening team. Lastly and especially: Father Tim Higgins, Father Ed Hinsperger, Deacon Michael Foulger, seminarians John Ha and Peter Hoan, and St. Clement’s parish staff … Your witness, your example and your faith have been and will always be an inspiration to me as we seek to deepen and grow our faith together. Looking forward with hope, I pray that we may continue to prosper in many ways as God consistently brings talented, gifted and spiritual people to our family of St. Clement. To all of you: May this New Year be a year of hope and serenity. Happy New Year! St. Clement, pray for us! The scandal of child sexual abuse and its cover-up rocks the Church. Since the report made public in Pennsylvania, several parishioners have asked me questions; others have talked to me about this crisis. Some have sent me emails expressing their anger and some are considering their options as regard to their very membership in the Catholic Church. Some people think and feel that they cannot belong to an institution that is so corrupt. Nothing that I will write is intended in any way to lessen our horror at the evil of sexual abuse. On the contrary, as a priest, I have felt shame, pain and sorrow. And how I feel is not comparable to how the victims have suffered pain by this crime. We must again apologize and ask forgiveness. But there remains much more to be done to prevent this sort of crime. Pope Francis has responded to Pennsylvania’s report and ordered that all Church leaders are to respond to whatever is required to support victims and to take every step to prevent this crime. In our Diocese of Hamilton, in past years Bishop Tonnos and now Bishop Crosby have and are taking every step to prevent this crime from happening. This crisis helps me reflect deeper on our Catholic Church. When Jesus died, the community He founded fell apart. Jesus had been betrayed and His followers fled. From the beginning, our first Pope, Peter, was a rock: Jesus promised, “You are Peter and upon this rock I will build my church, and the gates of Hades will not prevail against it.” Peter was also a source of scandal; and yet he and his successors are the ones whose task is to hold us together so that we may witness to Christ’s defeat on Good Friday and to Christ’s Resurrection on Easter Day. In Jesus, God triumphed over all that would destroy the Church: sin, lies, crime, suffering and death. And so, the Church is stuck with me whatever happens. I must admit that it is very difficult for me as a priest to lead in this time; I may even be embarrassed to admit that I am a priest, but I remain faithful to Jesus’ Church because Jesus kept shameful company from the beginning. My brother Bishop Joseph and I just came back from a visit with our family in Vietnam. When we arrived in our home parish in a remote village in Daklak, Vietnam, the local government did not allow us to celebrate Mass in our home parish. We felt disappointment and frustration. Many Catholics in Vietnam, China and many parts of the world still suffer imprisonment and death for their faith in Jesus. There have been always enemies from within the Church – meaning Her members and Her leaders – and there have been always enemies from without. Let us focus on Jesus. Jesus founded the Church to be His bride. It is from Jesus that we receive the great commandments to love God and neighbour. It is Jesus who instituted the Sacraments. It is Jesus who taught us how to pray and who continues to inspire holiness in our way. The pain inflicted on many victims, the shame that has affected the Church and the persecution of Christians in the world compel all of us to offer our constant prayers for the victims and for the wounds of our mother Church. May our sorrowful mother Mary who stands faithfully by her Son, Jesus Christ, on His cross ever guide us, Jesus’ followers, on our journey. ​As you may know, an increasing number of companies and government offices have become scent-free. This change in policy has taken place due to the number of people who are sensitive to perfumes, colognes and other scent-related products such as body sprays and mists (and regardless of the type or cost or amount of the product used). ​When these people are in a situation where they cannot remove themselves from a strong scent they experience a number of debilitating symptoms. There are a number of such people attending Mass at St. Clement’s each week. Although they make an effort to avoid being close to the scented person they are not always successful and they either have to leave Mass or stay and suffer the consequences. Therefore, for the health of all parishioners, we kindly ask that you refrain from wearing any type of scent while attending Mass. God will bless you for your benevolence. We thank you for your understanding and we appreciate your love of God and neighbours. Our parish has many people bringing Communion to a loved one at home or in the hospital or to a non-related, infirm parishioner who cannot attend Mass. Hamilton Diocese has issued guidelines for those performing such an important service. It is not permitted to place a Consecrated Host in a pyx presented to a Eucharistic Minister in the Communion procession at Mass. Instead the parishioner has two options. The first option is to place the pyx with an unconsecrated host on the altar BEFORE Mass. The second option is to present the empty pyx to the Priest, Sacristan or Eucharistic Minister AFTER Mass; they will then retrieve the Blessed Sacrament from the Tabernacle and distribute it to those waiting. In short, Communion enters the pyx after Mass rather than in the Communion procession. The Diocese also states that it is not permissible for a parishioner ask for more than one Host at a time for one recipient; it frowns on the practice of taking multiple Hosts for distribution over a number of days. Reverence is paramount and it is unacceptable for the Blessed Sacrament to be kept outside the Tabernacle. In addition, Consecrated Hosts must leave the church in a pyx and must not be carried in a Kleenex or in some equally unsuitable manner. Making exceptions to the above must be discussed with the Pastor. We are aware of the fact that some shut-ins may not receive Holy Communion at all if the person who brings the Host cannot comply with the Diocesan guidelines. These practices will be in effect beginning next weekend, November 11th/12th, 2017. ​Thank you to all who exercise this ministry of compassion. We are very grateful to everyone who brings the Blessed Sacrament to our brothers and sisters who are unable to celebrate Mass with us on Sunday. Our parish of St. Clement is truly blessed with many people who serve in many ways, and among them is a notable group that helps us raise our hearts to God. They are our music ministers. We have an unbelievable roster of long-standing musicians: +Maureen Wilbur (d. 2004) was an organist for 31 years, and +Tom Pawelko (d. 2014) led the Praise Choir for 35 years. George Schaller retired in 2012 after 64 years as Organist; he still sings in the Resurrection Choir at the ripe young age of 92. Marilynn Franks, Organist/Music Director, celebrates 55 years at the console this year; Rick Donahue, Assistant Organist, 45 years. This totals 230 years of ministry by five people, and does not include the service of preceding Choir Directors, nor Greg Gardin who currently leads the Praise Choir, nor the relative newcomers: Minstrel/cantors Peter Shaw and Aldwin and Cecilia Quinones; occasional musician Frances Walker; cantors Lorraine Adams, Danguolė Donahue, Fatima Hall, Anne Maley, Jenn Mascarenhas, Andrew Renner, Patti Roy and Sue Sawyer. Amazing! And with them, we sing: “I will give thanks to you, LORD, with all my heart; I will tell of all your wonderful deeds” (Psalm 9:1). Please share this message with your family and friends. For convenience, since there are many venues in the Cambridge area. For connection, because your parents or grandparents are parishioners of St. Clement Church. For the school connection, because you attended one of Catholic schools in our parish. For the sacramental connection, because you were baptized or received other sacraments at St. Clement Church. but there are Canonical and Diocesan protocols. (c) A copy of recently issued baptism certificate(s). Your priest will forward these documents to the Chancery of your given Diocese. Your Diocese will then issue the Testimonial Letter. Upon receiving these documents – the Testimonial Letter along with (a) through (c) above – the Diocese of Hamilton will grant me the Nihil Obstat to celebrate your wedding at St. Clement Church in Cambridge (Preston). Marriage preparation is required. The format and programme(s) vary from Diocese to Diocese. There are no shortcuts, so please meet with your current pastor who will help you with this process. Once the Canonical and Diocesan protocols have been met, I am free to meet with you and your fiancé(e) to plan and prepare the wedding ceremony at St. Clement Church. I hope this clarifies the process of preparation. Please do not hesitate to call me if you have any questions. A very special “Thank You” to all who made the funeral celebrations for Father Phil Sherlock the fitting tribute that our former Pastor deserved. The outpouring of support and generosity, both in prayers and in time spent in preparation for the funeral celebrations, were overwhelming and are deeply appreciated by both myself and the Sherlock family. I would especially like to thank the staff of St. Clement’s who, despite the heavy emotion of these days, rose to the task of organizing and attending to every detail, large and small. Thank you, also, to the many volunteers who offered their time and talent with great generosity and love. I am asking for your understanding and support regarding an important and pending change to our Parish Mass schedule, namely the elimination of our Saturday 8:00 a.m. Mass. There are several reasons for this. As the only resident priest, I often have to handle a full Saturday schedule with Mass first thing, maybe a morning funeral, an afternoon wedding (sometimes two), and then Confessions at 4:00 p.m. followed by the 5:00 p.m. Mass. The three Sunday Masses follow. There are first Communions and first Confessions and other occasional liturgies which also take place on Sunday afternoon. We have been blessed to have Father Tim's help on Saturdays (and some weekday Masses) but Father also celebrates weekday Masses at the Marian Residence and ours is not the only parish to call on him for help. Father Ed Hinsperger, while making St. Clement's his home base, is a missionary priest with responsibilities in Northern Ontario. My further responsibilities as your Pastor cannot be ignored. I could not manage the affairs of our parish without the dedicated volunteers who manage the various ministries and I wish to remain responsive to their concerns. I also need time to prepare my homilies, address administrative issues, respond to the unexpected (sick calls, hospital calls, drop-ins with serious problems, etc.) and prepare couples for their marriages. I have discussed the above with our Parish Council who stated that they were aware that other Cambridge parishes no longer had a Saturday morning Mass and Monday morning Mass. I am sorry to disappoint those who frequent Saturday morning Mass, but little else changes: The Confessions after the Saturday morning Mass will now be heard after the Wednesday morning Mass, beginning June 7th; and Monday morning Masses will continue. Parish Council has moved that we discontinue Saturday morning Masses beginning in June. The last Saturday morning Mass will be celebrated on May 27th, 2017. For years, St. Clement's Parish has served the needy. We are well-known in our community, especially through the hard work and dedication of our St. Vincent de Paul Society. In honour of the parish's generosity and the efforts of our volunteers, a benevolent parishioner has donated a life-size statue, "Homeless Jesus". "Homeless Jesus" is a sculpture by Timothy P. Schmalz, an artist who for over 20 years has sculpted monuments for the Catholic Church. He is devoted to creating art which glorifies Christ. 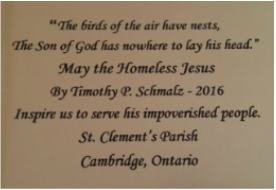 Mr. Schmalz's "Homeless Jesus" is a reminder of Our Lord's love for the poor and His call to care for them. ﻿It is beautiful that our ministry to the needy has inspired others to be so generous. Not only was the sculpture a gift, but the cement pad foundation was also a gift. Thorne Construction donated the foundation and also covered the cost of installing the sculpture. May it be a commemoration of Jesus' self-sacrificing love and an inspiration to continue to serve for many years to come. We are proud of our beautiful church! Our parishioners work very hard to maintain it, both inside and out. We have now almost finished restoring the church exterior: Some of the brick needed to be replaced, and some areas needed to be re-mortared. We thank Bob MacDonald for managing this project to keep our building not only looking beautiful but from being damaged by the harsh winter weather. Thank you for your patience and your continued support. "St. Clement, pray for us!" as the home in which we encounter You in our daily lives. and we are united in a local community. that are ours as witnesses of You to our age. Keep us open to our need of Your love and fellowship. Let us work together to see and to serve You in others. that life on earth is short – and the life to come, eternal. Lead us safely to the endless joy of Heaven. Grant this through Christ, Your Son and Our Lord. Amen. St. Clement, pray for us.